Three years of war against Yemen, in which the coalition forces committed violations, which rose to the level of genocide. This was confirmed by a human rights organization that held a symposium in Geneva in conjunction with the Human Rights Council. “Killing using various means and starving in many ways, to subjugate the Yemenis and make them bow; a way that is continued to be used by the Saudi-led coalition,” human rights activists in Geneva said. “The international community and the powerful nations were accused of participating in the killing of Yemenis by failing to fulfill their duty and stop the aggression or by selling weapons for Saudi Arabia and the United Arab Emirates,” they added. 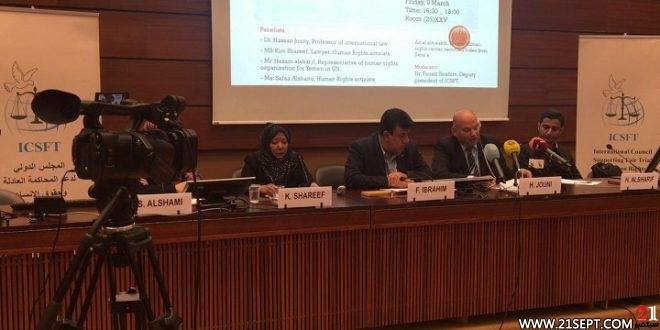 “Because of the aggression against Yemen, thousands of Yemenis have died as a result of the use of cluster weapons sold by the powerful countries and ‘Israel’ to Saudi Arabia and its alliance,” Yemeni human rights activist Safa al-Shami said in a speech at the seminar. “We say that there is a war that took place in Yemen, this is the official definition, and there is no other definition,” Professor Hassan Jouni, a professor of international law, confirmed during the seminar. “The international community has not implemented its duty toward the war and all the steps taken by the coalition countries, which account for crimes against humanity,” said lawyer and human rights activist Kim Sherif. “The attack on Yemeni sovereignty is also a flagrant violation of the UN charter,” she continued. Video clips presented at the seminar revealed massive numbers of systematic destruction of Yemen’s infrastructure. While other sections showed the magnitude of the massive destruction caused by explosions of neutron bombs banned internationally. Death, destruction, hunger and siege; the most prominent features of the three years of the war against Yemen. Human rights organizations have been calling upon the conscience of the international community and its concerned institutions, which it regards as a partner to the suffering of the Yemeni people.